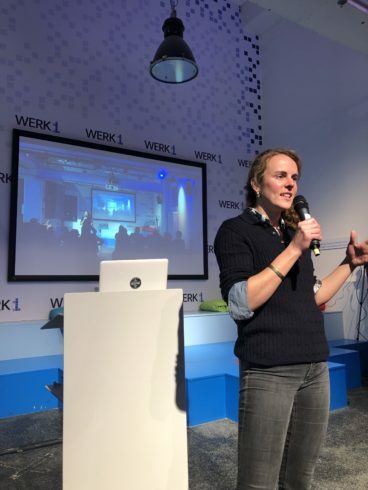 In our first Meetup of 2019, we invited people to Werk1 to listen to three presentations around the topic of “Blockchain as a Social Technology”. The special thing about this Meetup was the decentralized nature of the event. Parallel to the event in Munich there was a meetup hosted by the University of Bayreuth and Fraunhofer FIT. The two locations were linked via a live video feed. 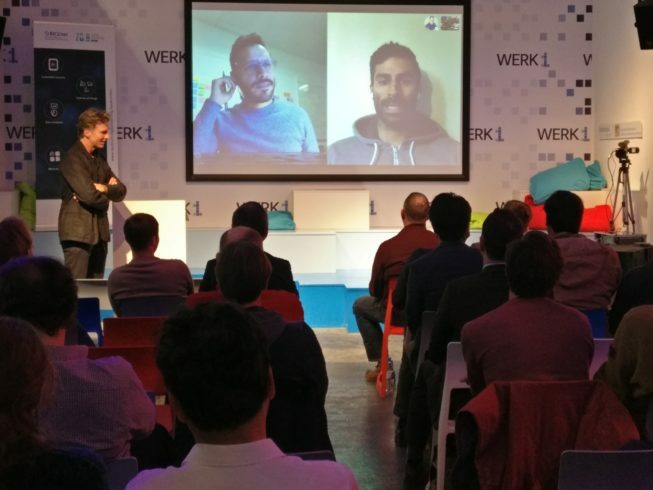 Additionally we piped in guest speakers from remote locations in Denmark and the USA. Everything was broadcast in real time via a live stream on our website. You can rewatch the video here! The first presentation was held by Jon Hearty, Business Development Director of Origin Protocol. He gave us some insights about blockchain-based decentralized marketplaces and the many social implications of this innovation. Moreover he talked about his blockchain platform for building decentralized marketplaces ‘Origin Protocol’. According to Jon, many of today’s marketplaces that seem to be fully P2P have central companies sitting in the middle of all transactions which hoard and swallow the data to monetize it later. With the use of a blockchain-based decentralized marketplace, problems like these can be avoided. He sees four major advantages to Origin's approach to decentral marketplaces. The drastic reduction of transaction costs. Companies who run the platforms often request high transaction fees for basically just matching a buyer and a seller. With the use of blockchain there is no need of an intermediary so that the transaction fees can be put back in the hands of the buyers and sellers. Redistribute value more fairly throughout the networks. Users have a major impact on the success of the platform but hardly benefit from it compared to the platforms’ founders or directors. Cryptoeconomic incentives provided by a blockchain powered platform to distribute the value more fairly within the platform so users also benefit as a network effects set in. Promote free and open commerce. Many marketplaces aren’t available all around the world, they are limited or banned to a special region or heavily regulated. In the face of regulation, a company who runs the platform is a single point of failure. Decentralized Platforms don’t have this characteristic which makes them able jump in where where platforms like Uber, AirBnB are banned or regulated. Making services available to the unbanked. Billions of users worldwide don’t have access to financial services but they do have access to cheap smartphones and therefore wallets to store their values. The unbanked can leap from traditional financial system and make transactions over a blockchain-based network. Origin Protocol itself just launched a blockchain-based marketplace as a dApp (decentralized App). As underlying technology Orgin Protocol uses the Ethereum Blockchain and IPFS (InterPlanetary File System) for identity management. Go and check it out on https://dapp.originprotocol.com/#/. Our second speaker of the Meetup was Pablo Velasco from the University of Aarhus who focuses on the digital culture through its technical infrastructures including the political and social aspects of technology. In his research, he deals with topics such as how the development of social technology happens and how it contributes to micropolitics such as how social relationships modify the outcomes of certain technologies. As an example, technology can be used as a political tool for including or excluding relevant stakeholders in a system. Regarding the blockchain technologies that rose up during the last years, Pablo said, that they can be merged together as a list of attempts of some sort of parallel payment system or decentralized, electronic money. In Bitcoin, for instance, the key element was the exchange of economic value using cryptography and this cryptography was a elementary need for the social integration of the technology. He also pointed out how different technologies have impact on the social interaction. As an example, sending coins over a blockchain network requires a new and different trust paradigm and therefore builds up a new type of social interaction. 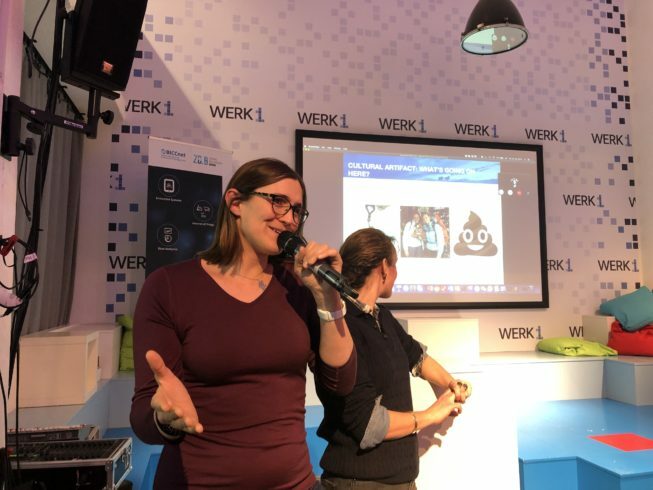 In the third presentation Anna-Laura Liebenstund and Rebecca Johnson from the European Blockchain Association presented the importance of a governance model in decentralized organizations. They pointed out why it is important to have regulations in the use of technology and how the interaction impacts our social behaviour as well as the way we think. A key aspect was that we have to be very careful about the inputs, design processes and implicit cultural assumptions behind our development of new technology. Artificially intelligent agents, for instance, will always be a reflection of the training sets to develop them. Technology without principals will become antisocial sooner or later. As a result, we need governance as a framework for techno-social interactions. Recent projects like ‘the DAO’ failed and Bitcoin and Ethereum got forked because of inconsistent governance. 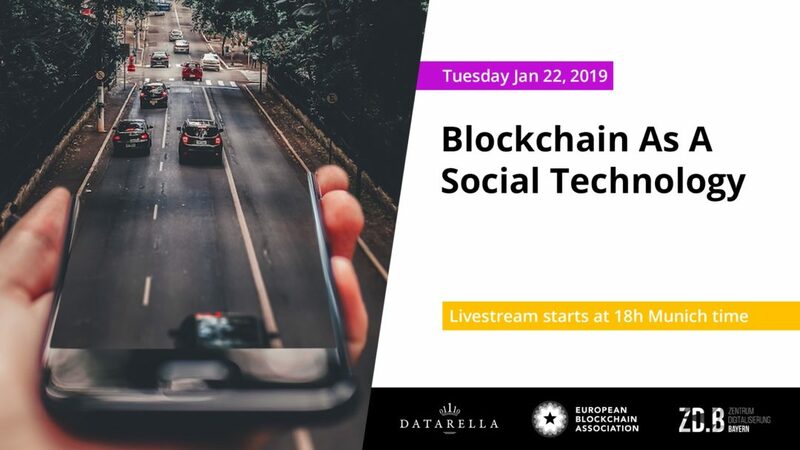 Therefore it will be important for decentralized organizations to establish common principles, ethical code of conducts, membership rules and a solid basis in existing social networks to ensure the durable success of the organization. 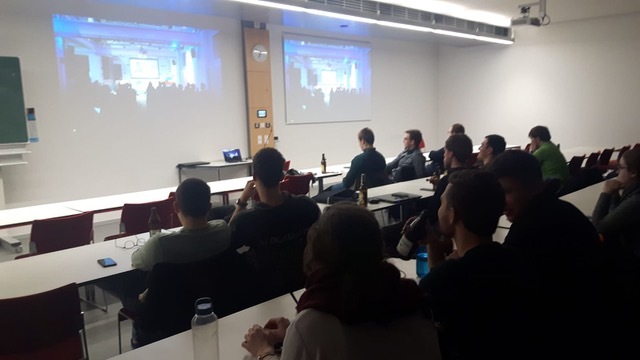 We want to thank the speakers for their very interesting presentations on this, the opening meetup of 2019! Also, thank you to the team of Werk1 who provided the location, organized the catering as well as providing support for the A/V setup. And we thank ZD.B for supporting the meetup in general! We also want to thank our audience in Munich and Bayreuth for attending. We hoped you enjoyed the Meetup. Feel free to give us your feedback. 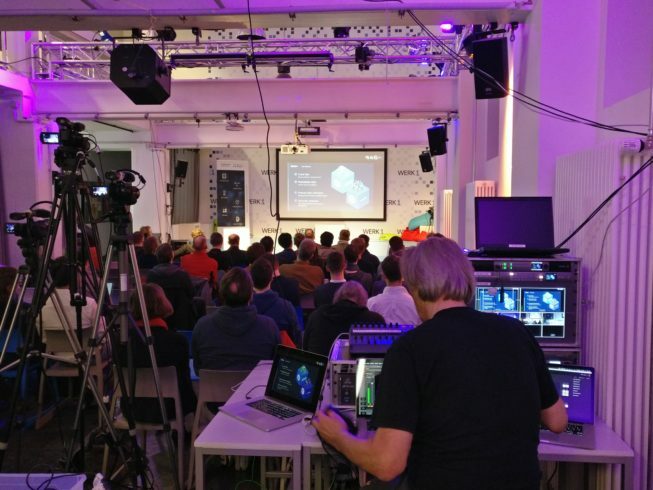 Our next Meetup will take place on Tuesday March 19th, 2019 on the topic ‘Privacy by Design?’. We would be very happy to see you there again!